School has started, I am still in culinary school one day a week, and I am playing football! It’s busy right now but while my mom and I commute we are discussing some fun videos for the holidays. 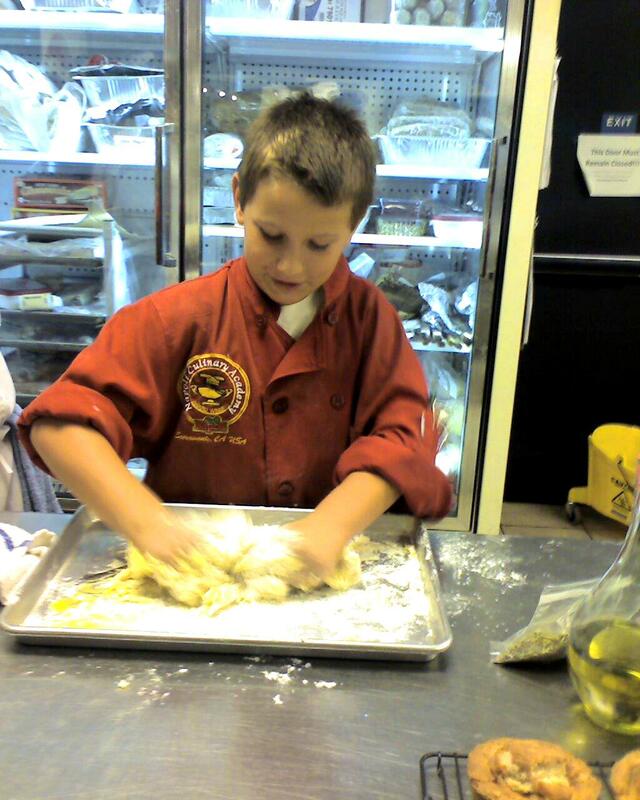 Oh, and check out my You Tube channel to see my new series called “Mason’s Basic Skills for Success in the Kitchen.” For adults it might be getting back to basics, but for most kids, they are just learning so I am starting with the basic-basics! Check it out and leave me some comments to tell me what you think. I am doing a cooking demo at the TomatoFest in Auburn on Sunday, September 29. This is a pretty special date because it was one year ago that I did my very first cooking demo – at the TomatoFest! How cool is that? I am really glad my mom said “yes” and let me do it. This picture is of me at culinary school today making pasta from scratch. I made ravioli and I filled them with seasoned chicken and cheese. I can’t believe how easy some of these things are to make, but they do take more time than just putting the store-kind of pasta in a pot of hot water. So tell me, what kinds of ideas do you have for special holiday food? Do you have family traditions of recipes that you just have to have to make the holiday seem complete? Share them with me and maybe I can make them. Stay tuned, we have lots more fun to come.